We watched Forks Over Knives a few weeks ago and have begun exploring a vegan diet. After a few weeks of trying to implement it here and there, I feel that I could fairly easily go vegetarian, but vegan would be hard. I love eggs and cheese! I can work around meat, but I want cheese on just about everything! But, my cheese obsession aside, it's been fun to explore different ways of eating, and I do find myself feeling a lot better. I have started to collect some really yummy and really easy recipes that I am excited to share with you. Since this is the first one we made, I decided this would be the first one we would share! Despite the fact that it sounds pretty boring and bland, it's incredibly flavorful! I was really surprised by this dish and find myself craving it a lot! First, cook your rice, and your beans if you are not using canned. I'm lazy, so I used canned beans, I just make sure to rinse them thoroughly. Sautee your onion, peppers, garlic and seasonings over medium-high heat. If you find them sticking to the pan, just add 1 or 2 tablespoons of water. Add black beans and 1 cup of water. Cook for 10 minutes, adding more water if it seems too dry, but careful not to add too much! 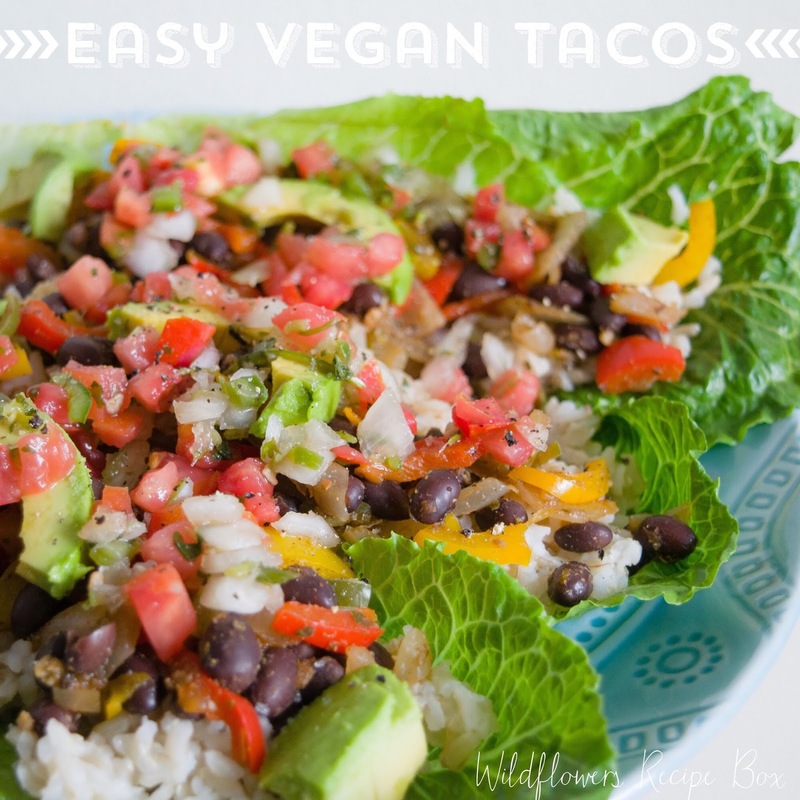 Serve in lettuce with rice, topped with avocado, pico, lime, and cilantro. Hopefully you enjoy this recipe as much as we do! It is so quick and easy to whip together, and despite how simple it is incredibly flavorful! It keeps really well too and makes for a great quick lunch!